Shot over four years, Resistencia: The Fight for The Aguan Valley follows three members of Honduras’ landless farmers’ movement as they take control of the plantations of the most powerful man in Honduras. All in the midst of the first coup d’état in Central America in three decades. It is without doubt one of the most daring acts witnessed in recent Latin American history. The film has already received standing ovations at the Quebec Film Festival (RVCQ) in Montréal, the International Political Cinema Festival (FICIP) in Buenos Aires, alongside presentations in Austria, US, UK, and of course Honduras. It has been seen on millions of televisions throughout Latin America, Spain and the United States in a primetime broadcast on teleSUR (the world’s largest Spanish-language public broadcaster). 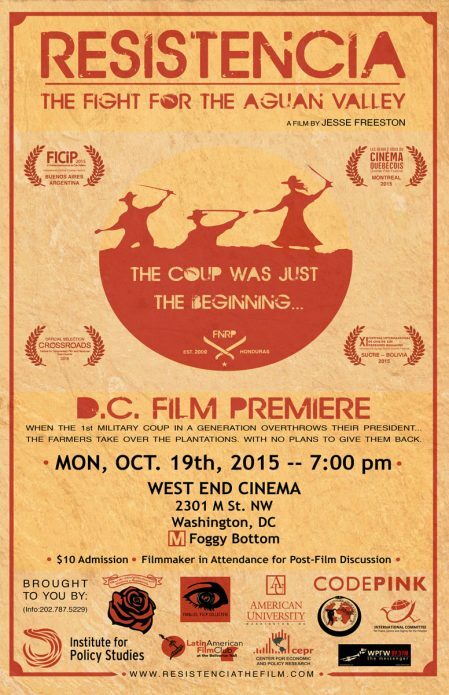 This DC premier screening of the english version will include a discussion with filmmaker Jesse Freeston and other panelists, moderated by IPS Associate Fellow Manuel Pérez-Rocha. Co-sponsors: Institute for Policy Studies, International Committee for Peace, Justice and Dignity to the Peoples, School of Americas Watch, Department of Anthropology-American University, CodePink, International Capeira Angola Foundation DC, Howard County Friends of Latin America, Parallel Film Collective, Latin American Film Club, Center for Center for Economic and Policy Research, and WPFW 89.3 FM.